Depending on who you choose to believe, the margarita was invented in Tijuana, Ensenada, Juarez, Acapulco, or Galveston, Texas, within about 10 years on either side of 1940. Since then, the iced elixir of tequila, triple sec (citrus liqueur), and fresh lemon or lime juice served in a salt-rimmed glass has seen more experimentation than a Captain Beefheart concert. While there’s nothing probably wrong with pounding pitchers of cheap tequila, supermarket marg mix, and blended ice, we knew there had to be a better way. 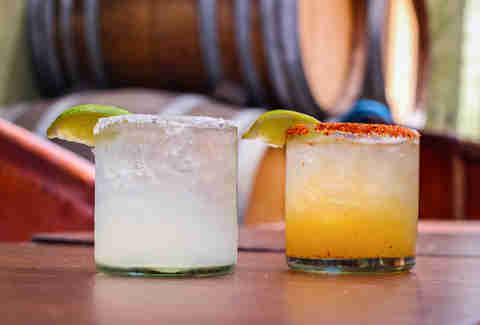 To find out, we drank our way across town in search of San Diego’s best margarita with a twist. 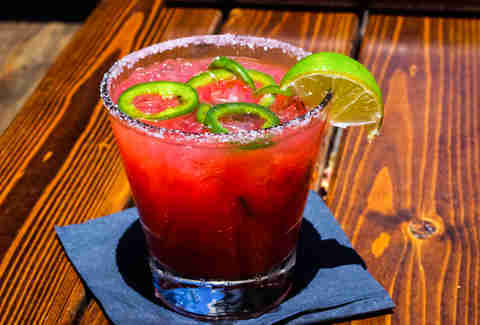 There’s little arguing that 2016 is the Year of the Spicy Cocktail(TM), and fiery margaritas are the stars of the party breakdancing on the coffee table. 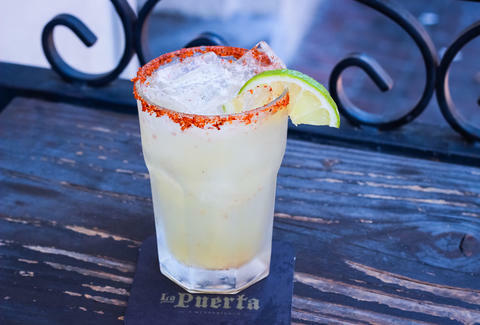 La Puerta makes the spicyrita its own with a shot of oak barrel-aged Dos Lunas with muddled serrano chilies, fresh lime, and agave nectar. The serranos pack about triple the heat of the more commonly used jalapeño, while the agave syrup cuts acidity, making for a balanced but boisterous swill. If heartburn isn’t your jam, frozen classic margs go feliz Tuesday through Sunday from 10pm to close for a smooth $5 a pop. Cantina Mayahuel offers over 300 Mexican spirits and even has its own brand, Don Lorenzo Reposado Reserva. While we’re of the opinion that a good liquor is best served straight-up, it’s hard to pass on the epic happy hour from noon to 6pm, Tuesday through Friday, when margaritas and palomas (Squirt instead of triple sec), made with your choice of tequila or mezcal, are five bucks each. Let’s continue with a wild one. The Sandia -- which is Spanish for "watermelon" -- trades out tequila for a shot of sotol, which is distilled from a spiky desert shrub that grows in northern Mexico. The sotol tastes more or less like dirt, but it’s earthiness is brought to life by a splash of spicy Ancho Reyes chile liqueur, fresh lemon, and, you guessed it, juiced watermelon in a Tajin-rimmed glass. Follow it up with a Tiki Sombrero #2 (a tricked-out Mexican Mai Tai) or a Tijuana Moods, a bebop of liquors alluding to a Manhattan, which bar manager Mark Broadfoot created in homage to jazz bassist and Tijuana regular Charles Mingus. 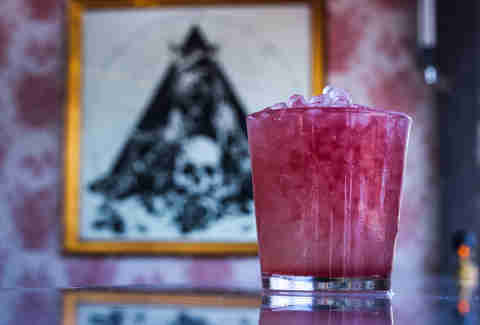 Despite its diabolical moniker, the Satanico Pandemonium is one of the more forgiving spicy margaritas around. Credit that to silver tequila infused with cucumber to temper the jalapeño, plenty of fresh lime, and a garnish of mint. If you prefer smoke over fire, go for a Oaxacan Old Fashioned with blanco tequila, mezcal, chocolate bitters, and orange. Both go for six bucks during happy hour from 3-6pm and 10 to midnight daily. Chase ‘em with a few Chicago-style deviled eggs, $5 happy. Buy the ticket, take the ride with this homage to the Good Doctor of gonzo journalism. Mezcal and pineapple-infused rum set the foundation for agave, raspberry, lime, and barrel-aged bitters. The result is smoky and tropical, with a lingering oak that soaks into the candied pineapple garnish. Calling this a marg would be playing fast and loose with a purist's definition, so check out the No Esposa with Corralejo Blanco, lemon, and habanero strawberry shrub. 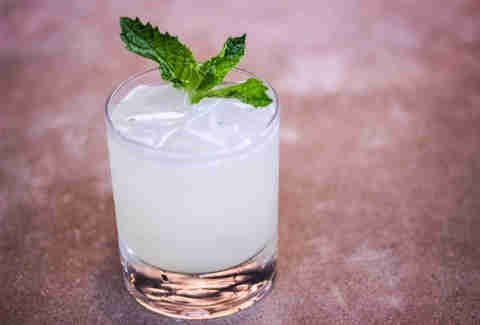 The shrub gives an almost apple-cider-vinegar zing to the smooth agave spirit, while a basil leaf drifts lazily on top. 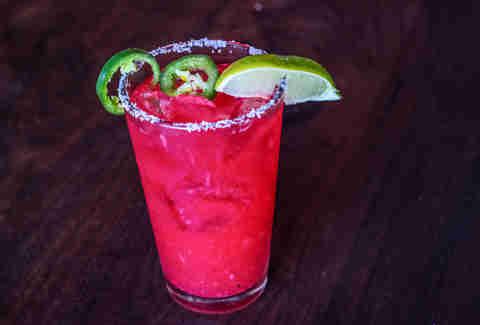 Here we have another take on the spicy marg. This time, the Giro tequila is infused with roasted peppers and blackberry, which give this drink its vibrant hue, before being shaken with fresh lime and agave. $8 from 3-6pm daily. San Diego Is a Bar. What’s Every Neighborhood Doing? Yet another spicy marg, but this one has blood orange. The Hornitos silver base, topped with the strong, bitter citrus juice packs a strong punch, making for a pretty good sipper that you wouldn't be completely disappointed in ordering. 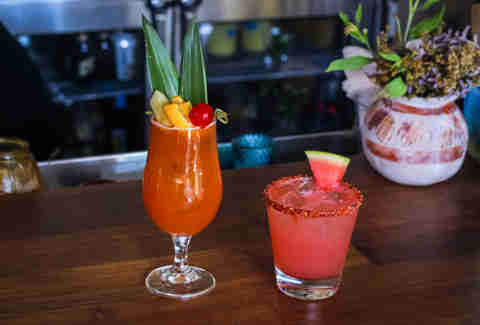 Check out the most recent offerings from Tijuana chef Javier Plascencia during the generous happy hour running from 11:30am to 6pm on weekdays, when his namesake cocktail goes for $8. The Javier Wallbanger dresses up blanco tequila with sweet, herbal Galliano liqueur, vanilla, lemon, orange, and allspice dram. It comes out nuanced and delicate, with a lingering hint of Christmas. 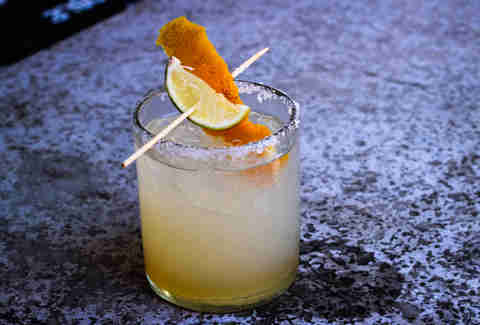 The Mercado is true to the original margarita recipe, but pulls from higher quality ingredients: Casa Noble Crystal organic tequila, Pierre Ferrand dry curaçao (the Daddy Warbucks of triple sec), local organic citrus, and agave. This drink comes with house chips and salsa to snack on, but if you’re there between 9pm and midnight on a Saturday, you’ll get a free taco when you order a Puesto Perfect Margarita. Touting what is no doubt the most encyclopedic collection of agave spirits in town, this Old Town hooch museum carries nearly 3,000 selections, though only around 1,000 are available to buy. The Tequila Mule reinvents a West Coast classic with reposado, passion fruit juice, ginger beer, fresh lime, and agave nectar served in a copper cup. This one is probably our favorite on this list. Black Sabbath's "The Wizard" plays over the stereo at this black metal-themed vegan eatery while bar manager Dave pours a marg spin-off that is sweet and creamy without going full white girl. Red drops of crème de cassis (blackcurrant liqueur) drip like blood through crushed ice, reposado tequila, herbal génépy, and fresh lime. The oaky reposado is carried by a pleasant velvety texture, while the zing of lime underpins it all without usurping the throne. Try or die. A server at The Patio recommended the Trust Cocktail #2, and it’s pretty evident why they did. Much like The Patio’s Satanico Pandemonium, the Trust #2 adds cooling cucumber to jalapeño-infused tequila, then takes it a step further with grapefruit, agave, and firewater bitters made with habanero peppers. So, so good. Chad Deal is so ridiculously hungover after researching this article. Share your recovery tips @chaddeal.